The Anchorage School Board on Monday approved a $36.3 million plan to fix two Eagle River schools heavily damaged in the Nov. 30 earthquake. The board voted 6-0, with one member absent, to endorse a plan previously adopted by an ad hoc committee formed to make recommendations for the future of Gruening Middle School and Eagle River Elementary, which have been closed since the magnitude 7.1 quake. According to Anchorage School District consultant George Vakalis, fixing Gruening -- including roof and stairwell replacement, seismic upgrades and other repairs -- will cost an estimated $24.2 million. Eagle River Elementary also needs a new roof, seismic upgrades and other fixes estimated to cost $12.1 million. 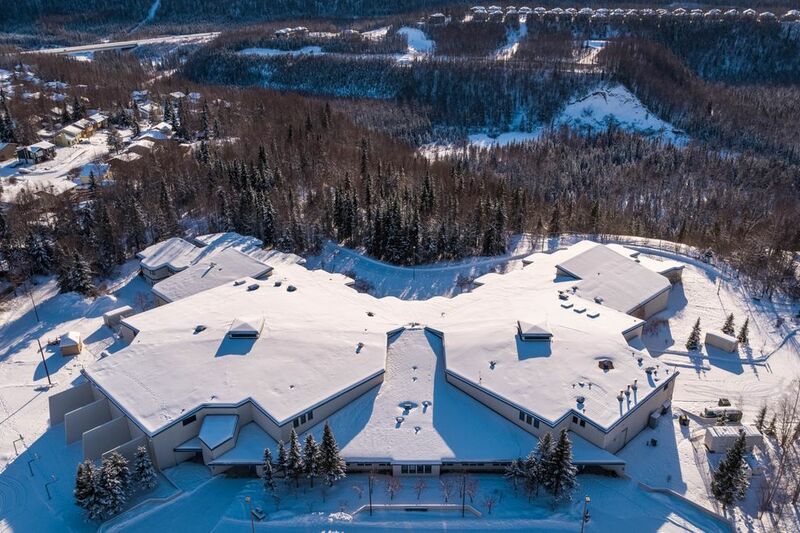 The cost to demolish and replace Gruening was estimated at $76.7 million, and the cost to demolish and replace Eagle River Elementary was $34.9 million. Vakalis said funding is expected to come from a variety of sources including a municipal schools bond that needs voter approval and state and federal funding. The district has been communicating with Federal Emergency Management Agency officials about its plan, and Vakalis said he hopes to soon hear feedback on how much of the estimated costs would likely be covered by the federal government. Though there was no board dissent, two people testified against the proposal. Ad hoc committee member Kaleigh Wotring said she voted against the plan in committee because she thinks it’s a short-term solution at Gruening, which has a long history of structural and design flaws. “Fixing instead of rebuilding just to get kids back into a building more quickly is just kicking the can down the road,” she said. District officials have said architectural and engineering reports -- which have yet to be released to the public -- show the schools can be made better than they were before the quake. Gruening teacher Michelle Foss also said she opposes the plan to repair the school. She and other teachers are not convinced the building can be made safe due to its many deficiencies, ranging from poor heating to creaky walls and a leaky roof. “Most of our staff are afraid to go back there,” she said. Vakalis said the ad hoc committee had no issues with the ability of Gruening to be repaired and pointed out most of its concerns in two meetings were related to the perception that Chugiak and Eagle River high schools don’t receive the same types of programs as students in larger district schools. “It had nothing whatsoever to do with the construction or the replacement of the schools. It had to do with programs,” Vakalis told the board. District spokesperson Catherine Esary said the engineering reports — which the district previously said would be available by the end of February — have not been posted online in part due to the large file sizes and issues with making the files accessible to the disabled. “One issue is that they are long, detailed, and have large amounts of graphics — in order to make any of that kind of information ADA accessible and compliant for our website posting, they have to be remediated,” Esary wrote in a Monday email reply to a request for the reports. In addition to endorsing the repair plan, the school board also went along with the ad hoc committee’s request that a second committee be formed to look at programming issues in all Chugiak-Eagle River schools and ways to improve education opportunities for students. District officials say it’s likely to take 24 months for both schools to be repaired. During that time, Gruening students will continue to attend classes at Chugiak High while Eagle River Elementary students displaced by the quake will be divided among other elementary schools in Eagle River through rezoning.